Students of the Port Kaituma and Matthews Ridge Secondary schools, engaged in a debate competition last week, held in observance of GBTI’s Port Kaituma branch anniversary. This year’s competition, held on March 11, was the third to be held by the company in consecutive years. It was noted that the company is aiming to involve other schools in other districts next year. “Given GBTI’s history and influence in the Region, we have decided to work along with the District Education Office to show our support towards the importance and impact of benefitting from a sound education and we hope that our participation in events like these can ignite other initiatives from varying institutions or business persons in the region,” Liam Wong, of the GBTI Port Kaituma Branch stated. 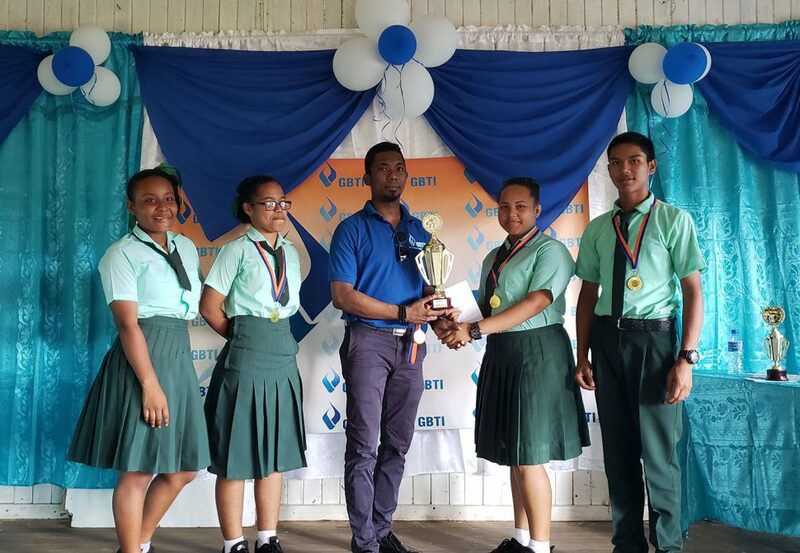 A release from GBTI related that Port Kaituma Secondary defeated the opposing team, with Cassie Alberts and Keron Williams emerging the best speakers in the junior and senior categories. It was stated that the students “stood out with their clear articulation before the judges” —Orlando Thorne, Alex Allen and Clarice Mendonca. The debate competition was preceded by a Spelling Bee Competition held earlier in the week, in which Port Kaituma Secondary students were also involved. It was also supported by GBTI. “It was good, the students and teachers were very excited, there were a few parents supporting their kids and it was bigger than last year,” Wong reported. “GBTI extends congratulations to the participants, the regional administration and officials: Ms. Althea Forde, Ms. Jillyann Willis, Ms. Marcelyn Allen and Ms. Lurlene Mendonca,” the statement read.